Thank you all for coming back to my blog. 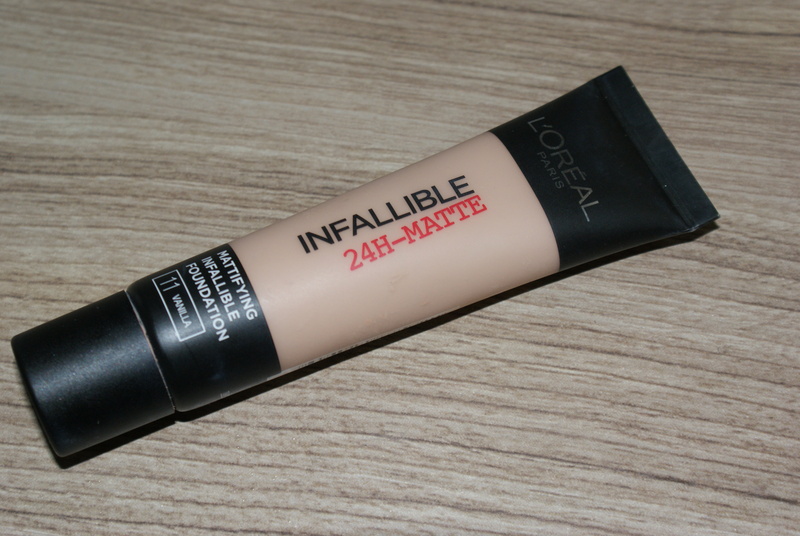 Today I am finally posting my review on the L’Oreal infallible foundation. I know there are a lot of reviews on this product but I just wanted to write my opinion on this product. I have tested this foundation for quite some time now so I can give a reasonable review. Plus I have tested this foundation 5 days in a row. Also I have tested this foundation with and without MAC Strobe-Cream because I am at heart a dewy finish kind of girl. For my skin tone I purchased the Foundation in the colour 11 vanilla. In Holland you can purchase this foundation for € 15.99 which is quite steep comparing too other countries for this foundation. If you are curious if this foundation is worth the price , just read along. So let’s get this 5 day review in diary form started. Today it was the first day to official test drive the foundation. I moisturized my face as usual and then applied foundation with the Real Technique foundation brush. All I noticed was I did not like applying this foundation with a brush as it went on patchy. I did correct the streakyness in the end but note too future self will use my Real Technique beauty blender tomorrow. Oh my god I love the look of the foundation and this colour is a perfect match for me. A rarity as I have really pale skin with a yellow undertone. The finish is matte but somehow I like it. In the late afternoon I noticed some dryness round my nose. Pitty but all and all the foundation looks good. Good morning face! And what difference a beauty blender and using strobe cream makes to this foundation. It looks so pretty and fresh. I did not notice any dryness round my nose. Hmmm am I falling in love with this foundation? At the moment I am. When I checked my face at +- 17:.00 hours it still looks good. Happy day 3. Today l used the same combi as yesterday and I still find it stunning. To me the combination of the strobe cream makes my face looks all refreshed. Somehow I did end up with some dry patches on the nose. Maybe a bad day to wear this foundation? Today I chose to go without the strobe cream. Even though I am not a matte kinda gall, people at work noticed that I was wearing a matte foundation, and I don’t mean in a bad way. My colleague said she loved the matte finish on me.She said I looked really good. Yeeh its always awesome to get compliments. Hearing this it does inspire me to get out of my comfort ( dewy) zone. Today my foundation wore good however I had some dry patches at the end of f the day rond my nose. Maybe it was because my face was lacking my sufficient moisture. O well you are never to late to lean about your skin. Ah my last day of testing the foundation for reviewing purposes. I tested this foundation without strobe cream however I did make sure I moisturized like crazy. And Voila nooo patchyness or dryness during the day. My face looked awesome all day and as usual the foundation wore well during my working day. This foundation is suited for people with normal skin or combination dry skin. If you have very dry skin this is definitely not the foundation for you. As you will experience most likely flaking. I reckon this foundation will be awesome in the summer as it will cancel out any shine during extreme heat. I have to say I do prefer using this foundation with the MAC strobe cream. Maybe, like I wrote before I am a dewy lady. Also I prefer using a beauty blender and even my fingers over a foundation brush. Another benefit of this foundation is that it lasts a long time without any touch-ups. I would not say this foundation lasts 24 hours but has lasted me a good 12 hours. I can even go to the gym without my face looking crazy afterwards. Would I repurchase this foundation? Oh yes I would. I would for the coverage,the look and the feel. That’s all for now folks. Hope you enjoyed this post in a diary format. Let me know what your thoughts are on this foundation. Thank you for reblogging my posts😁! You gave me a great b day present. You are welcome my dear.